The Royal Botanic Garden in Edinburgh (RBGE) has published an air-quality self-assessment package aimed at improving people’s knowledge about clean and polluted air. 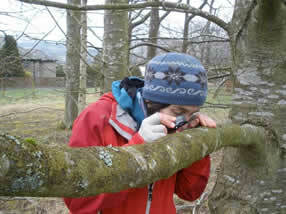 Organisms called lichens are according to the RBGE ‘excellent indicators’ of environmental health and local air quality. A lichen is a composite organism that comes from algae or cyanobacteria or both living among filaments of a fungus in a symbiotic relationship. The kit according to the RBGE can be used by individuals, schools and community groups to investigate the evidence for and against polluted air. All information delivered from the survey will go to the Edinburgh Living Landscape initiative. Frances explained her involvement in the project. She said: “I wanted to start communicating more widely and in new ways about the need to protect the environment and this led me to a full time three-year BSC in Countryside Management at Aberystwyth University. For more information, download the survey.